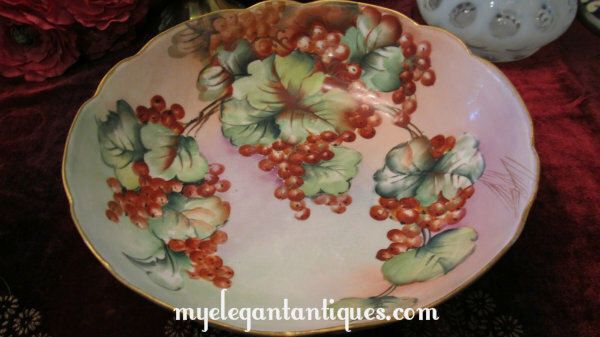 The Antiquarians are thrilled to offer this large, lavishly hand painted bowl from the Limoges region of France, produced by the firm of A. Klingenberg & Dwenger. 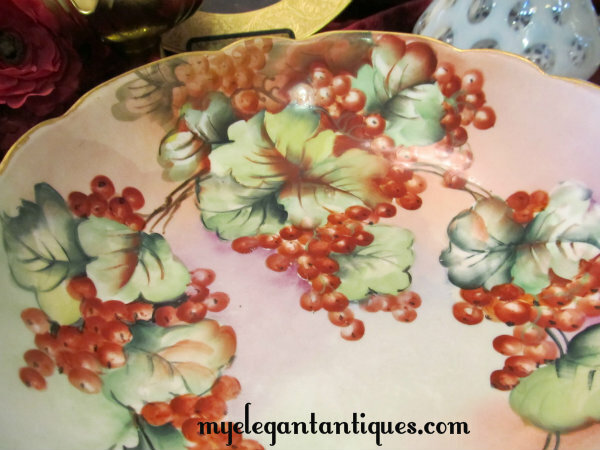 Based on the backstamp (see our photograph), this lovely bowl was produced sometime between 1890 -1910, which sadly, is the year that this company closed its doors. 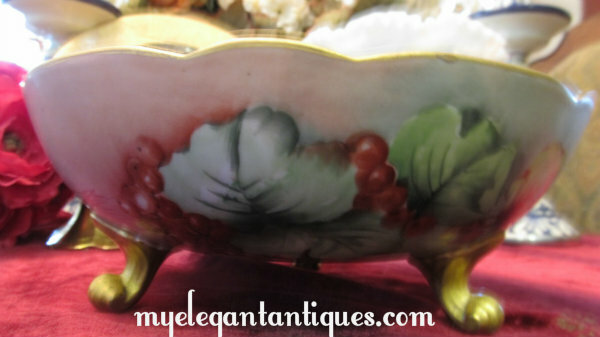 This stunning 3-legged bowl is in excellent condition. 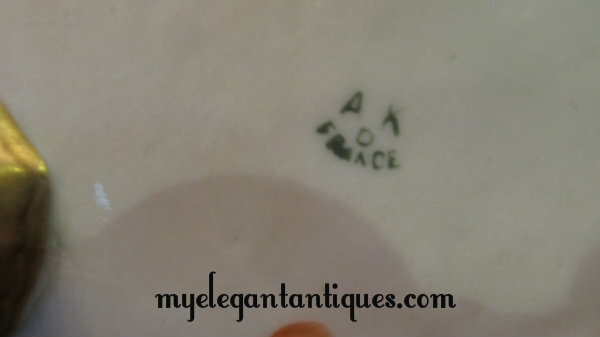 Aside from an errant speck of paint on the rim, and a tiny bit of clay that attached to the rim of the bowl from another piece that was placed too close in the kiln, there are no chips, cracks, nicks or other condition issues to mar the beauty of this antique piece of delicate porcelain. 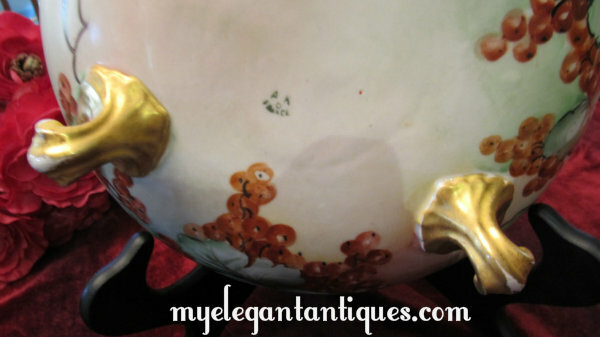 With the exception of some light wear to the underside of the feet, the gilding on the scalloped rim and legs of the bowl is also in very good condition. We invite you to examine our photographs -- we think you will agree that this piece has been remarkably well-preserved! The rim of this bowl measures 9" in diameter, and it is 3-1/2" in height. 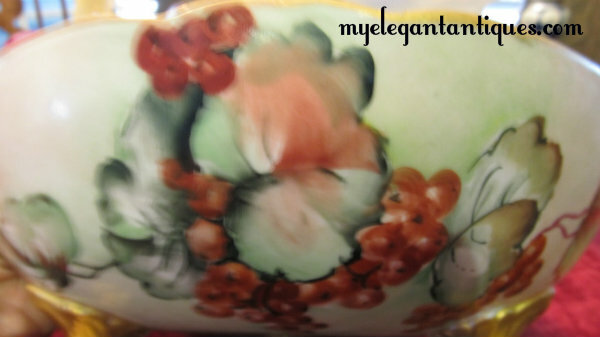 The hand painting on this bowl is truly exceptional. 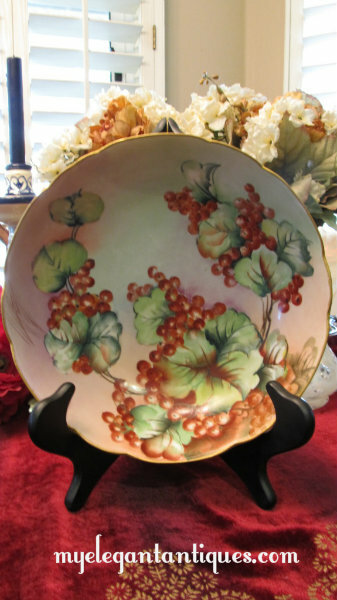 Set against a soft, sponged background of light green shifting to rose and then amethyst hues, an elaborate and skillfully painted design of red grapes and green leaves adorns both the exterior and interior walls of the bowl. There is literally no significant area of this bowl that has been left with a plain, unadorned surface. Sadly, we have been unable to find a signature anywhere on this magnificent piece. 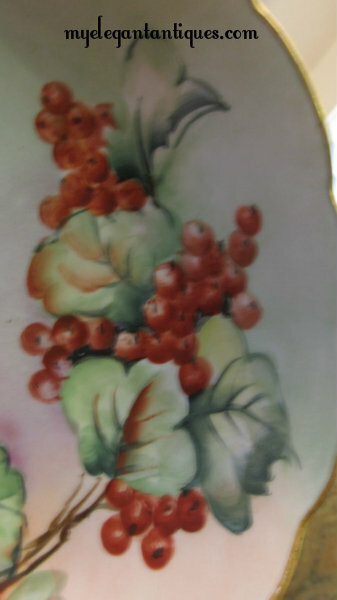 We do believe, however, that it was painted by an artisan from Klingenberg and Dwenger's studio. This porcelain firm existed for a mere 20 years, but produced some remarkable pieces of decorated porcelain. This is your oppportunity to acquire a piece of history and a work of art! BRIEF HISTORY: A. Klingenberg was involved in a number of porcelain manufacturing concerns in Bavaria before opening a porcelain factory and decorating studio in the Limoges area of France in the early 1880's. Klingenberg's company merged with Charles Dwenger's decorating studio in 1890. Some accounts report that Klingenberg and Dwenger knew each other because Dwenger had previously worked as a clerk for Klingenberg's company. Whether this is in fact true, we do not know. 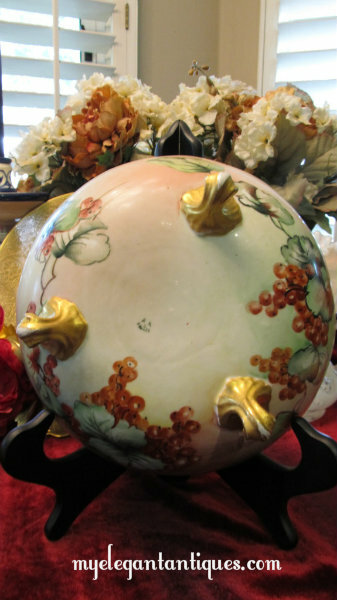 What is undisputed is that the two gentlemen merged their businesses and proceeded to manufacture and decorate their own porcelain wares and then export their products throughout Europe and to America. After Klingenberg died in 1894, Dwenger proceeded to purchase a full interest in the factory and export business. Unfortunately the business closed its doors in 1910 and the wares of A. Klingenberg & Dwenger were made no more.